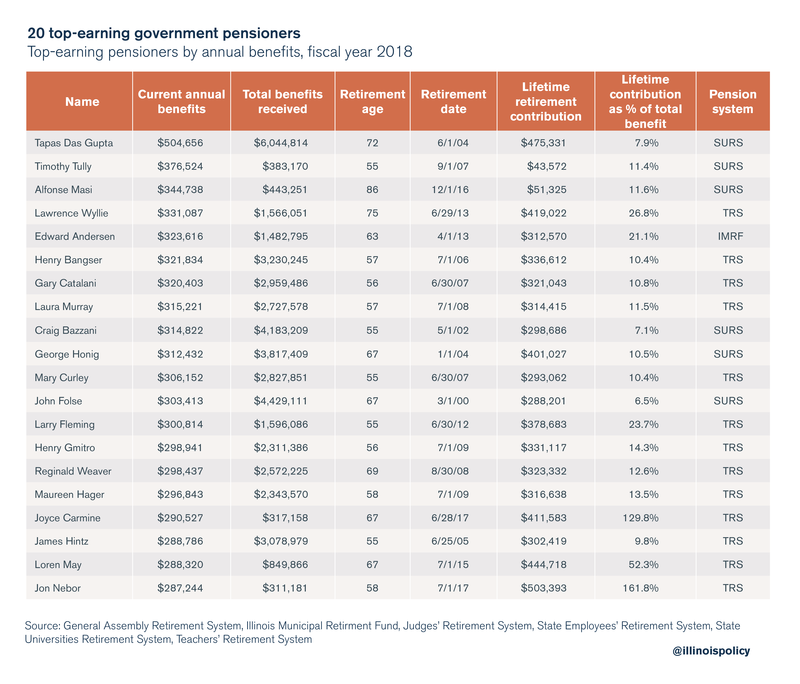 Six-figure pensioners enrolled in those systems contributed an average of $160,100 toward their own retirements over the course of their careers, and retired on average at age 59. 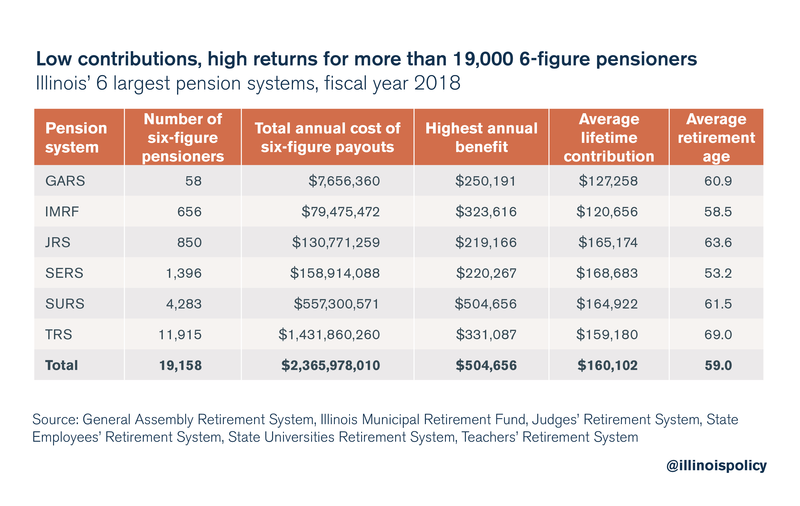 Illinois’ six largest pension systems include: the Illinois Municipal Retirement Fund, or IMRF; the State Employees’ Retirement System, or SERS; the State University Retirement System, or SURS; the General Assembly Retirement System, or GARS; the Judges’ Retirement System, JRS; and the Teachers’ Retirement System, or TRS. TRS pays out more than $100,000 annually to nearly 12,000 pensioners – the largest number of six-figure pensioners among the six systems. SURS comes in second, with 4,283 members receiving annual benefits exceeding $100,000. Dozens of state lawmakers who bear responsibility for Illinois’ pension crisis are also receiving six-figure pension payouts from GARS. The top annual earner among the six systems is University of Illinois, Chicago professor emeritus Tapas Das Gupta, who received nearly $504,700 in fiscal year 2018. He has accumulated more than $6 million in benefits since retiring, despite having contributed only $475,300 to SURS – less than 8 percent of his total pension earnings. Timothy Tully, who retired from Southern Illinois University, Carbondale at age 55, received $376,500 in benefits over the year, despite having contributed a total of just $43,600 to the fund during his career. John Folse, another Southern Illinois University retiree, received $303,400 from SURS this year, and has collected more than $4.4 million total since retiring – the third-highest total among all enrollees. He contributed only $288,200 to his retirement plan – less than 7 percent of his total benefits. Individual pensioners do not deserve blame for these excessive benefits. Illinois state lawmakers are responsible for the state’s unsustainable pension systems. To illustrate the size of these costs, suppose the annual pension payment for all six systems’ enrollees had not exceeded $60,000 – just above the state’s median household income of $59,196. This would have reduced the systems’ combined payout by around $2.2 billion, or 16 percent of the systems’ total combined outlay. Because state employees pay an average of just 4 to 8 percent of what they receive in retirement benefits – 8 to 16 percent including investment returns – taxpayers would have captured 84 to 92 percent of those savings, or between $1.8 and $2 billion. Had no pension payouts exceeded $100,000 in fiscal year 2018, the six systems’ total combined outlay would have decreased by more than $450 million. Rising pension costs have driven Illinoisans’ property taxes to among the highest in the nation, leaving taxpayers on the hook for massive debts. They have also caused routine calls for tax hikes at the state level. The state’s officially reported pension debt sits at $130 billion, while Moody’s Investors Service lists the state’s unfunded pension liability at $250 billion. Enrolling all new government workers into 401(k)-style plans would alleviate the growth of future government retirement costs while protecting already-earned pension benefits. Ultimately, state lawmakers must amend the Illinois Constitution to allow for changes to unearned, future pension benefits. Without such an amendment, Illinois taxpayers will remain subject to further tax hikes, and government workers’ retirement security will remain in jeopardy.